I got my copy signed at GenCon. Woohoo! 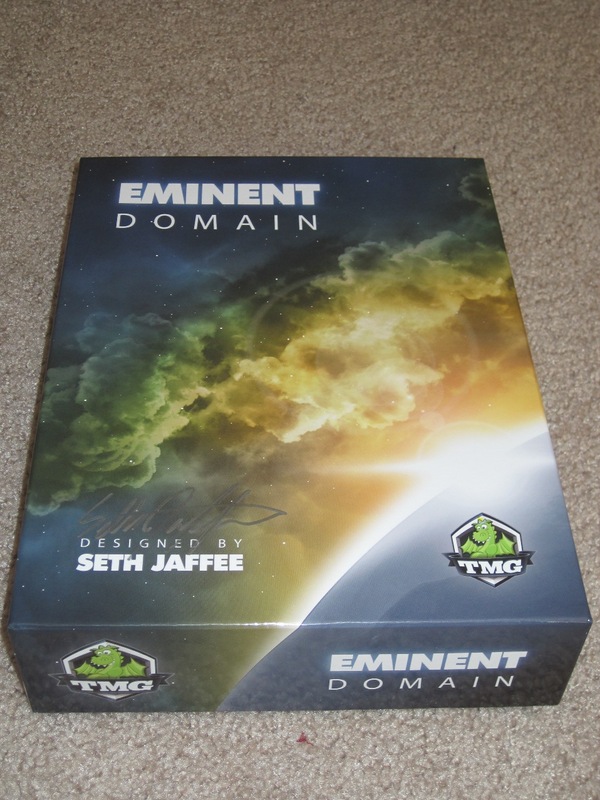 Eminent Domain from Tasty Minstrel Games, until just recently, was the largest board game success story on Kickstarter. It more than doubled its funding goal and attracted a lot of attention along the way. But lots of things can succeed in hype. The question remains: is the game itself any good? The short answer is yes, it is good. The long answer? Check out our detailed review below. 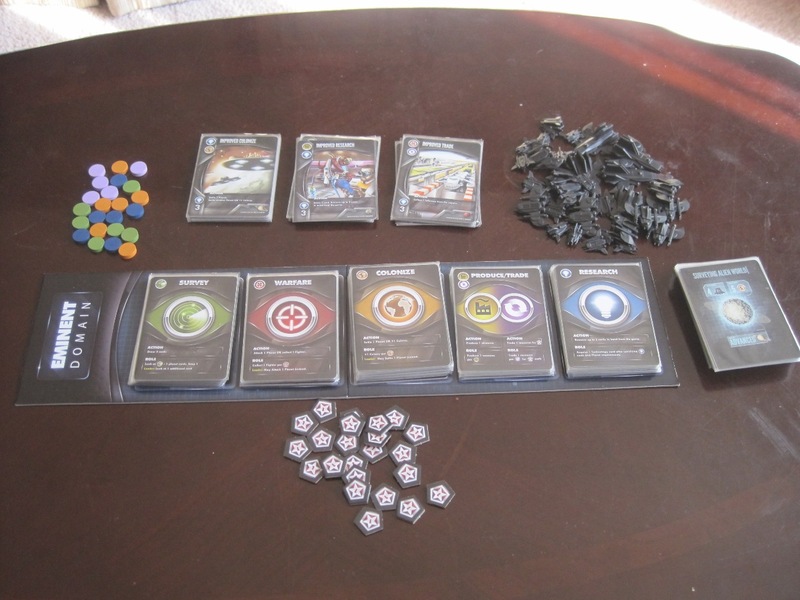 Eminent Domain is labeled a deck-building game, and while each player has his own deck that he adds cards to, it really seems to be more about role selection. The goal of the game is to end the game with the most “influence” (victory) points, which are earned by producing/trading resources, conquering/colonizing planets, and researching tech upgrades for your empire. Player turns follow three phases: Action (optional), Role (mandatory), Clean-up (mandatory). The action phase involves playing a card from your hand. Each card in the game (with the exception of a few techs and the planet cards) has an action associated with it, whether the action is drawing cards, settling planets, amassing fighters for your fleet, surveying new worlds for your empire, or removing cards from your deck. This is, more or less, what the game setup looks like. The active player then has the opportunity to “boost” the role he has chosen with cards from his hand that bear the same symbol. Boosting an action makes it more powerful, which, again, rewards players for choosing the role again and again. Once every player has dissented or followed, the active player “cleans up”—he may discard any number of cards from his hand and then must draw or discard to his maximum hand size (five cards to start with, though there are planets that increase the limit) and play passes to the left. This continues until all of the loose influence points are gone or a number of stacks are depleted (dependent on the number of players). Over the summer I saved my budgeted allowance so I could buy something at GenCon. My allowance isn’t much (and I’m not great at saving), so by the time GenCon rolled around, I had just enough to purchase one new game. 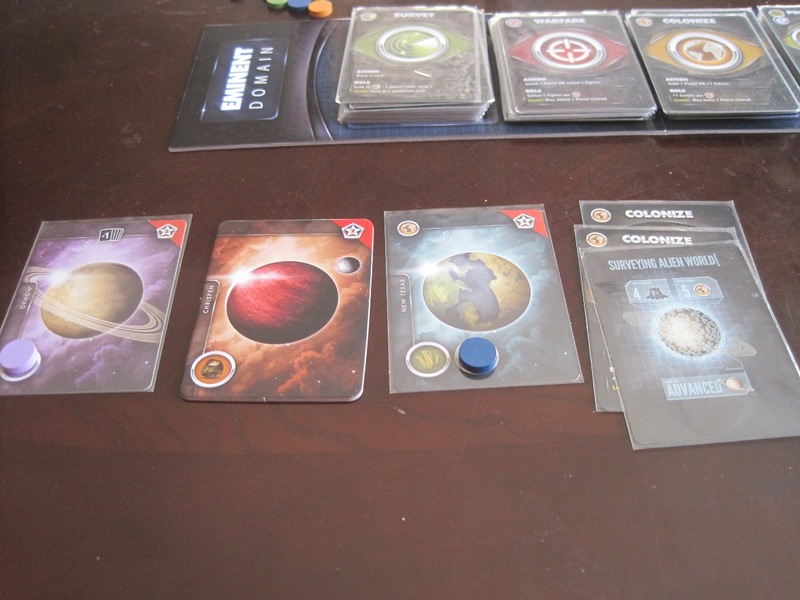 Before GenCon, I had my sights set on Eminent Domain. I talked myself out of it, saying, “Let serendipity and whim be your guide; don’t lock in too early.” But when I reached GenCon, the siren call of the Tasty Minstrel booth and Eminent Domain in particular was too strong to resist. And after playing several times, I can’t say I regret my decision. 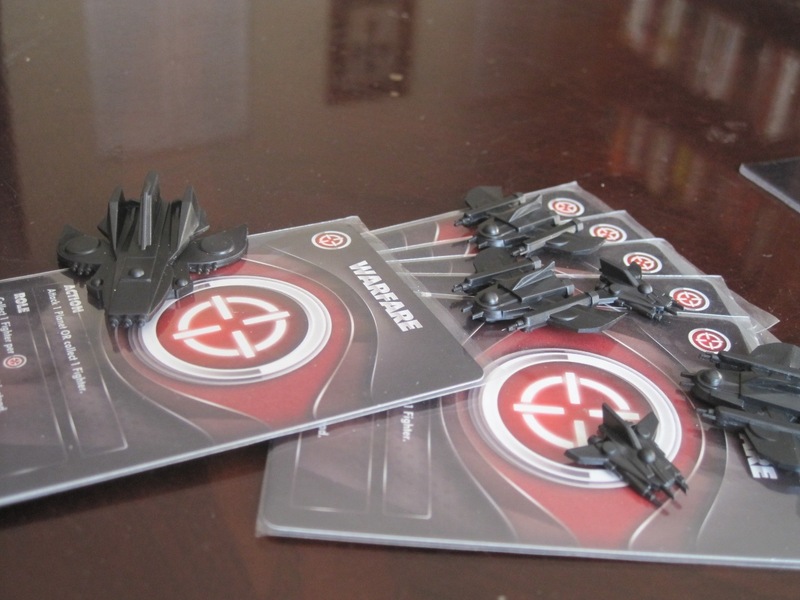 One of the things I really like about Eminent Domain is the design/layout. The game is fairly simple to learn (one of my criteria for what makes a great game), but where Eminent Domain stands out is in its simplicity of use. Each card that can boost or follow an action has the role symbols at the top left of the card—simple. A quick glance at my hand can tell me whether I should dissent or follow another player’s role. The iconography is simple and beautiful. It won’t take players several games to learn it (as in Race for the Galaxy), and it allows almost instant enjoyment of and immersion in the game itself. One of my grievances against some designer games is that the game mechanics are designed well, but the graphic design is ugly (El Grande, I’m looking at you). I cannot accuse Eminent Domain on this score. Seriously, well done, Tasty Minstrel. I also like the common supply of tech upgrades. The same tech upgrades are available in each game, but only one of each is available, so if there’s an upgrade you want, you have to move early; if another player takes it, you’re out of luck. Even though every card is present in every game (one of my early concerns about the game was replayability), each game is different because you probably won’t get every card you want. Here are some examples of planets. They are pretty. I really like the balance of this game as well. Even if a player wants to dominate the galaxy through warfare, there’s no way to get new planets to conquer without surveying; there’s no way to get new techs without researching. And the planets in a player’s empire play to strengths and determine what kind of techs are available should the player choose to research. This makes it so that a player must be well-rounded in order to have the best chance at winning. Becoming good at a role can be a blessing and a curse. Yes, it’s great that you can easily collect fighters; however, it’s bad when all you draw are warfare roles. 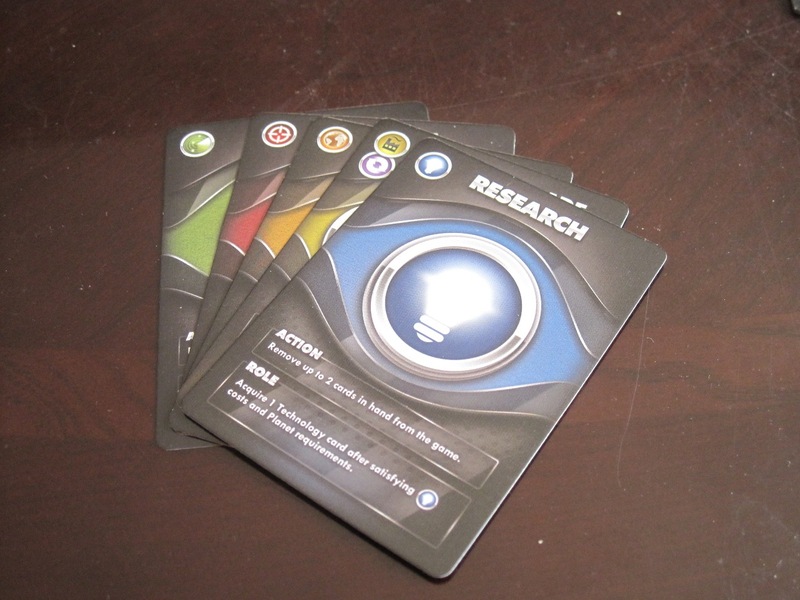 (Thankfully, the research role card played as an action lets you remove cards from your deck.) And the balance seems to work well since each game I’ve played the players had divergent strategies, yet we were all fairly close in score. This game is also more interactive than either Race for the Galaxy or Dominion. Each player has a decision to make on each other player’s turn. Obviously, this is present in Race for the Galaxy as well, but it feels more interactive here, perhaps because the decisions are not simultaneous. Dominion has spoiled me as far as game inserts are concerned. This one is passable, but it’s not super functional. This was the best layout I could find to keep the cards from going all over the place. Eminent Domain is fun and worthy of its Kickstarter success. It scratches a different itch than Dominion and is friendlier to newbies than Race for the Galaxy. The game can be played over a lunch hour and packs a lot of interesting decisions into its play time. Tasty Minstrel has hit a success with this one. I really enjoy this game. There, I said it. Pretty simple. Pretty straightforward. Eminent Domain is deceptive in a way. What I mean is it has excellent design—both in it’s classy, modern graphics and its clear, easy-to-understand icons and layout—that makes it seem almost simple, with not much depth. But this is just a surface presentation, and as you play, you begin to realize that this game has a lot of depth and a bit of a learning curve before you can truly master it. As @Farmerlenny mentioned, you get more powerful at any role you choose during your turn. However, you will not emerge victorious if you focus on only one or two of the roles. You have to balance everything you do with everything else you do, and everything all the other players choose to do as well. The follow/dissent mechanic is excellent—even if someone chooses a role that is of no use to you, you can still gain a benefit by increasing your hand with more potentially useful cards. But not only do you dissent on useless roles, sometimes you dissent on a role because it would be better for you to take that role yourself—you have to decide. The design is clear and beautiful. Well done, Tasty Minstrel! The point of all of this is to say that every role is connected and it seems very well balanced. I was worried that Warfare would be overpowered compared to colonization, but after testing that theory directly, it turned out pretty well balanced. Choosing roles is fun, and because you automatically take a card when you pick a role, you never get stuck unable to do anything. I also love the terminology—”dissent”—for some reason it just feels pretty good to go against the powers that be by “dissenting” instead of… i dunno… some other boring word. The plastic ships are a great inclusion too. While basically representing glorified counter tokens, the varied ship designs allow for a bit of imagination as you build your fleet and conquer planets. The learning curve may be a turn off to some people, though as I mentioned, the overall graphic design is very appealing and friendly—unlike a similar game, Race for the Galaxy (which I do quite enjoy), which is packed with a wall of intimidating icons. However, an experienced player—especially one who knows what kind of technology is available for research and can plan a strategy accordingly—will have a distinct advantage over a newbie. What Blake’s turn might typically look like. Warfare, warfare, warfare! I love that the game forces you to make choices, but rewards the choices you make. It has a more “expanding into the wonderful universe!” feel than “desperately struggling to stay alive!” feel. Both have their place, but I think the “desperate struggle” tends to get a bit more screen time, so it’s nice to have a change-up. If you like space games, if you like role-selection, if you like a game that rewards you instead of punishes you, Eminent Domain comes highly recommended. Especially if Race for the Galaxy seems too intimidating, or you want a little more control over what cards you have in your deck. 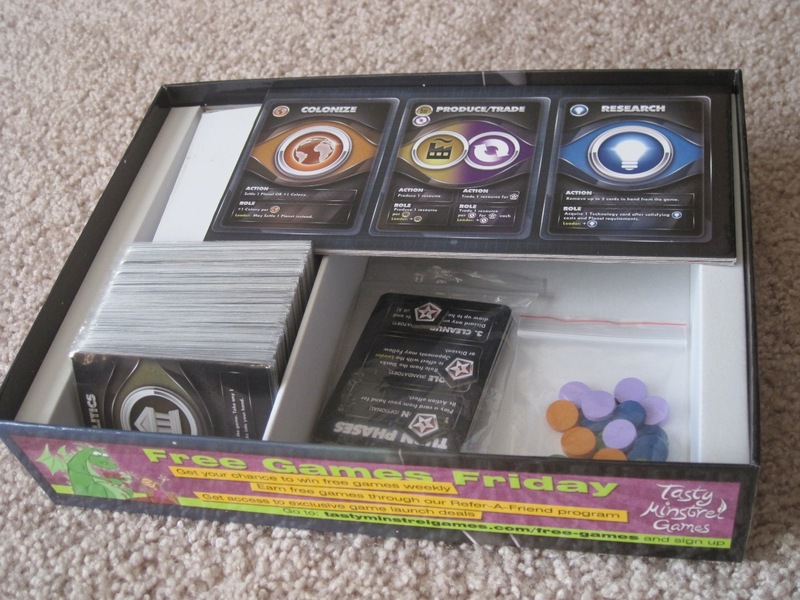 Previous ArticleFriday Question: What Is Your Favorite Two-Player Game? Awesome. I drooled over this at the Tasty Minstrel booth at GenCon, but spent tons of money elsewhere, so I had to pass. Fortunately, I picked up Glory to Rome somewhat by accident (I was buying The Resistance and they were having a buy 2 get 1 free sale and he said the magic phrase “top 100 on BGG”). So, hopefully it is also good and will help me hold off on Eminent Domain until it is more readily available. Nice. You’ll have to let me know how Glorty to Rome is. I kickstarted the black box version, so I still won’t be able to try it for a while. It looks quite fun (and intricate–the cartoony art is deceptive, methinks). Glory to Rome was on Kickstarter? Sweet. Unfortunately, since I just bought a copy of it, I probably won’t support it on Kickstarter – though it looks like it’ll be much higher quality components and a few variants. Great review! Thanks for posting this. I’m really happy that you enjoyed the game. Glory to Rome is an excellent game. I personally prefer the original ‘cartoony’ art myself, but the kickstarter campaign clearly indicates that plenty of people are in the market for different art. I’ve played over 100 games of GtR, and I can tell you it’s definitely not a simple, silly game (as you might think from the cartoon art)! @Seth–Thanks so much for commenting (and for designing the game, and for signing my copy, etc.). I’m looking forward to trying Glory to Rome; I’m not looking forward to teaching my friends how to play. Can you elaborate a little on the comparison to Race for the Galaxy? A lot of reviews say that this is just a weaker version of RftG (which many regard as the best game of this type). My wife and I had someone try to teach Race for the Galaxy to us at GenCon, and he ended up horribly confusing us (maybe he just wasn’t a good teacher?). We both greatly love Dominion so far, and are looking for a little variety. Right now, it’s down to Eminent Domain, Race for the Galaxy, and maybe Puerto Rico. Any thoughts? @FarmerLenny Thanks! I do think that the wife and I would enjoy Race for the Galaxy quite a bit. The person who taught us also said that there were some more advanced cards that he could/should have left out while teaching us. We’re going on vacation soon with the in-laws, and my wife’s mother might not like the complicated nature of Race for the Galaxy, although my brother-in-law would love it. San Juan looked terribly dull, and although Puerto Rico looked somewhat complicated, the game (through a clearer theme and use of tokens and game boards) seemed to be more straightforward. I must buy all the games! San Juan was pretty dull for me, and everyone I taught it to said, basically, “Oh, that’s nice. Let’s play Dominion again.” It certainly does have its fans, though. A game that might be great for this trip is El Grande. It’s pretty simple to learn, has lots of interaction, and is just overall fun. (Don’t let the box art deter you. 🙂 ) It’s not terrible with two players, but it hits its stride with 4+. I can’t speak for Scott, but I personally love Eminent Domain. We got an extra review copy shipped to us (Thanks Mr. Mindes!!) and he seemed super glad to get a hold of it though, so that bodes well. FWIW, we still have a month of games left to play, but EmDo is in my top 3 for favorite game played this year. As for Glory To Rome, it does have a pretty steep learning curve, but once you get past that it’s a really great game full of depth. Definitely takes multiple play throughs to grasp everything that’s going on.